The booking is advisable but not mandatory and the restaurant is open from Monday to Saturday to satisfy your tasty needs! RISTORANTE GRANO DURO is a comfortable place ideal for a business lunch or a pleasant dinner with family or friends in a warm atmosphere. Guests can choose from our menu typical dishes of Italian cuisine made with the exclusive use of fresh local traditional products. 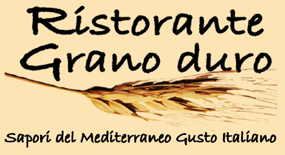 RISTORANTE GRANO DURO exclusively uses pasta obtained from selected durum wheat semolina, with a high protein content, extruded in bronze to be more rough, better absorb condiments and enhance Mediterranean flavors. The cultivation of durum wheat, richer in wheat protein, dates back to 5000 years ago and has always represented a simple and nutritious food. Durum wheat was part of the eating habits of ancient Rome, as was wine and oil. RISTORANTE GRANO DURO offers a wide selection of wines from all the Italian regions and in particular from Lazio and the Castelli Romani. It uses only extra-virgin olive oil, both raw on salads and in the preparation of dishes in the kitchen as it has excellent resistance to high temperatures. On the table you can always find homemade bread with natural yeast for an excellent bruschetta. Our kitchen will therefore guide you to know and appreciate the typical Italian flavors. Free parking for guests of RISTORANTE GRANO DURO.